A new study has found that 35 percent of U.S. cell phone users have apps installed on their devices, but only two thirds use those apps with any regularity. The study, conducted by the Pew Internet Research Center by surveying a little over 2000 U.S. adults, reveals that a third of people whose phones are capable of running apps of any kind don't use them—and that 11 percent are not actually sure whether their devices can run apps at all. 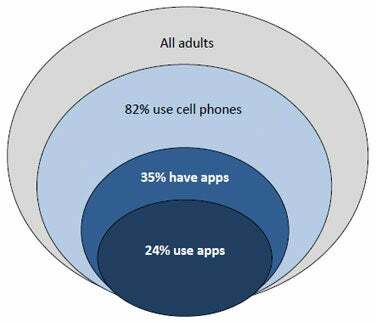 The implications of this survey are quite significant if one considers that, just two years ago, there wasn't really a mobile “apps culture” to speak of. Roger Etner, who co-authored the report, is quoted as stating “[e]very metric we capture shows a widening embrace of all kinds of apps by a widening population.” Etner goes on to say that app-centric phones are becoming an increasingly important element of the American technological experience, even if it's still too early to say what long-term impact the trend will have on the world of mobile communication.